I recommend collecting some or all of these herbs and putting them in a dish to free feed. The rats will pick what they want and need from the mix. Chickweed, containing vitamins B6, B12 and C.
Dandelion, excellent source of vitamin A, C, K, D and B complex; they contain 20% protein- twice that of spinach; and are a good source of minerals, including trace minerals. Dill, has also been shown to inhibit the growth of several bacteria which cause infectious diarrhea, also kills parasites. Milk Thistle, is an antioxidant and liver cleanser. Plantain, anti inflammatory, antibacterial, aids in digestion and helps respiratory ailments. Garlic Powder, anti parasite, immune builder, detoxifying, powerful natural antibioticic. Barley Grass, barley grass powder contains eleven times the calcium of cow's milk, five times the iron of spinach, four times the vitamin B1 of whole wheat flour, seven times the vitamin C found in oranges, and is a good source of vitamin B12. Possess many times the nutritional potency of green vegetables. Contains vegetable protein and high in minerals. Spirulina, studies have shown that Spirulina protected birds from infection with the antibiotic-resistant Staphylococcus aureus and E. coli. Its a powerful immune builder. High in protein. Stimulates birds to breed and helps in feather growth. Parsley, It contains more vitamin C than any other standard culinary vegetable, approximately three times as much as oranges and about the same as blackcurrants. The iron content is exceptional (twice as much as spinach) and the plant is a good source of manganese, calcium and potassium. It also contains flavonoids that act as antioxidants. Parsley is also rich in vitamin A, well-known for its effects on vision, plus can mitigate risks of atherosclerosis and diabetes. Raw parsley cleanses the blood, dissolves sticky deposits in veins, maintains elasticity of blood vessels, facilitates removal of moderately sized kidney and gallstones, treats deafness and ear infections, and benefits the sexual system. Cinnamon, is great for blood circulation and for anti blood clotting. Its great for the libido. It stops the growth of bacteria and fungi. Kills candida which causes respiratory distress and cancer. In addition to its unique essential oils, cinnamon is an excellent source of the trace mineral manganese and a very good source of dietary fiber, iron and calcium. Smells heavenly too and this causes increase in brain function! Oregano, Studies have shown that both of these compounds can inhibit the growth of bacteria, virus and fungi which is the main causes of many illnesses such as respiratory problems. Peppermint, is an excellent source of vitamin C and vitamin A. Peppermint is a very good source of magnesium, folate, dietary fiber, calcium, iron, and vitamin B2. Aids in digestion, helps headache and prevents cancer. Basil, also exhibits anti-inflammatory properties, anti-fungal properties. Basil is a source for Vitamin K, iron, calcium, vitamin A, manganese, magnesium, vitamin C, and potassium. It is good for the heart, because it helps to prevent build-up in the arteries and fights free radicals. The magnesium helps blood vessels to relax which increases blood circulation. This is a organic human grade mixture I make that is made of Peppermint, Egyptian Basil, Oregano, Garlic Flake, Cinnamon powder & Parsley. The rats love nibbling at it and I get the satisfaction of knowing its helping to naturally self medicate and prevent serious disease in my colony. 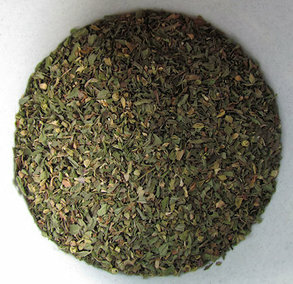 You don't have to make my exact mix, but the above list of herbs can be your guide. There is no measurement either, just add what you like. Again I get all of this from the Vitamin Cottage. The cost is usually around $2 per ingredient, and you get a generous amount! Usually I have all of these herbs and spices in my kitchen or garden anyway.